I write this post as I actively ignore the snow piled high outside my window and the single digit upon which my thermometer continues to hover. And so, I continue my quest to keep it green this cold, cold winter. Here, I’ve dressed up that old workhorse, broccoli, with lively Asian flavors. Ginger, soy, and sesame help to perk up a vegetable that doesn’t exactly light a fire in me. A finish of fresh orange juice brings brightness and light, something we are in sore need of in the dark days of winter. Enjoy the spring forward time change this weekend and all the extra light that too will bring! 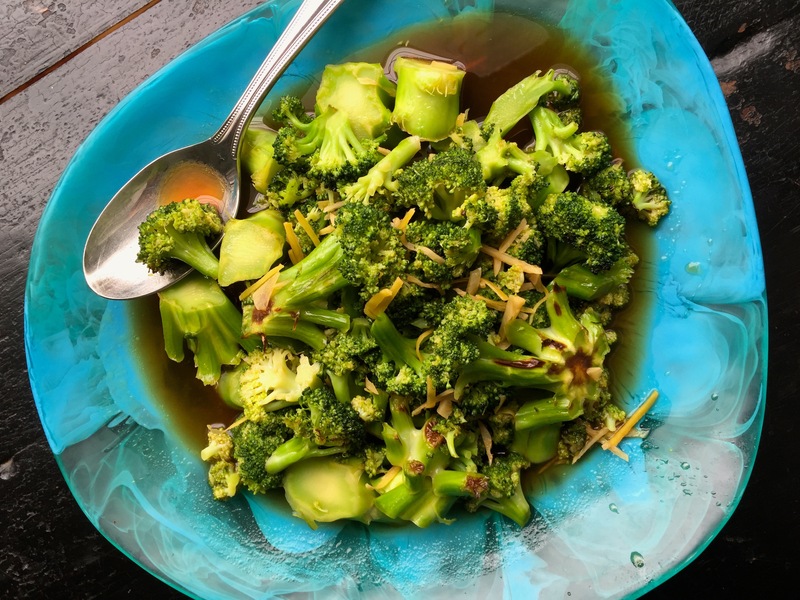 In a large pot of boiling, salted water, cook the broccoli until bright green and crisp-tender, 3-5 minutes depending on how small you’ve cut the slices. Drain the broccoli and immediately place on a baking tray large enough to hold it in one layer. Sprinkle over the sugar, toss, and broil for 3-4 minutes, until beginning to brown. Meanwhile, in the same pot in which you cooked the broccoli, heat the peanut and sesame oils over low heat. When hot, add the garlic and ginger and cook, stirring, about 11/2 minutes, until fragrant and softened. Be careful not to burn the garlic and ginger! Add the soy sauce and orange juice, stir, and remove from the heat. Pour the broccoli into the pot with the orange sauce and stir to coat all over. Serve immediately or at room temperature. This entry was posted in side and tagged Asian, broccoli, ginger, orange juice, sesame, vegetarian. Bookmark the permalink.